André Rieu, one of the world’s most successful artists in recent years and the super star of classical music, was honoured yesterday with a “Jubilee Award” – for 35 million sold CDs and DVDs, and for his 21-year partnership with UNIVERSAL MUSIC (UMG). He received the award from the hands of Frank Briegmann, President Central Europe UNIVERSAL MUSIC and Deutsche Grammophon, and Dickon Stainer, President and CEO of Global Classics, as part of UMG’s classical music conference in Rome. 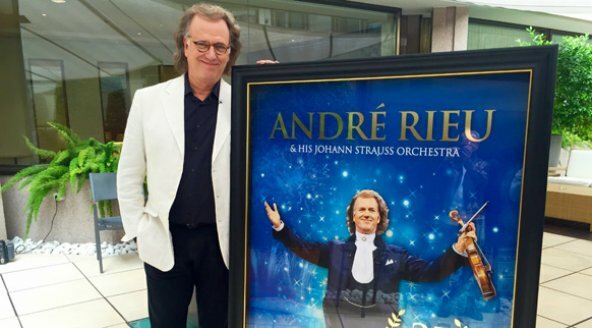 André Rieu is no stranger to the international pop charts – his album “Strauss & Co.”, for instance, stayed inside the German album charts for a total of 103 weeks -, and he has the rare ability to get people all over the globe excited about classical music. He is an internationally recognised maestro with the energy of a rock star. In Australia, he was the “Best Selling Artist” for three consecutive years (2008-2010). He is the winner of three Classical BRIT Awards in the category “Album of the Year”. On top of that André Rieu is setting new standards on the big screen: In the UK he took a record at the box office breaking £1 million in one night. André Rieu is one of the most successful live performers. With his Johann Strauss Orchester, incidentally the biggest private orchestra in the world, he plays more than 100 concerts every year and inspires millions of fans across Europe and the rest of the world. André Rieu is the head of a flourishing entertainment company, taking care of the creative side as well as business matters, and as such he has maintained a partnership with UNIVERSAL MUSIC for 21 years now. The biggest successes of his long and ongoing career were achieved together. His newest triumph is the release of his album “Roman Holiday” (“Arrividerci Roma” in Germany, Austria and Switzerland) which he is going to present today.